We perform DFM reviews for other companies. • DFM starts with the guidelines in the company’s DFM Manual. These best practices and guidelines should be applied to the CAD libraries. Footprints correctly designed result in higher yields and better reliability. • It is important to have DFM guidance and a useful DFM review of the gerbers. • Let AS Design engineering perform a DFM review of your design before gebers go out to Fab. How it works: Share your design with us or send us the gerbers early in the design cycle. We will send a DFM review back to you with pictures that point out not only the design flaw but the suggested DFM guideline to follow. 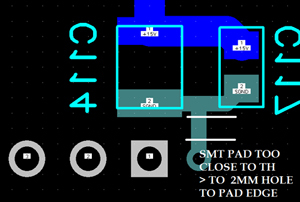 Not enough space for solder pallet between TH and SMT part. 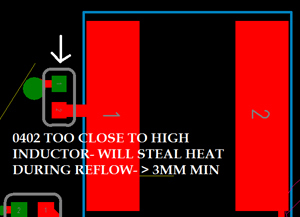 Process Wave soldering Small SMT too close- tall inductor will steal heat. AS Design Engineering has many years of experience with overseas factories. • A bridge between the design teams and the factory is extremely important. Reliability issues may arise and product returns can cost a company money and brand damage. • They use spacing rules and are not able to make decisions. 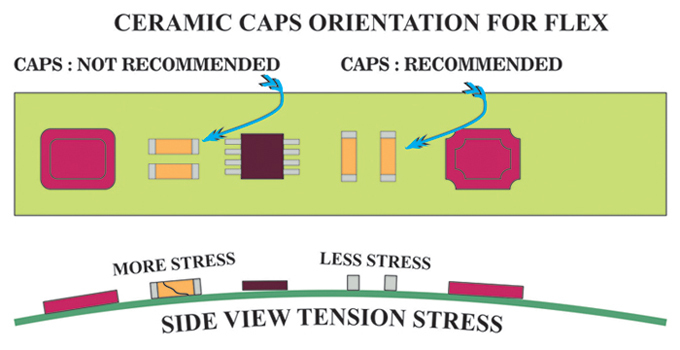 • For example, DFM rule that radial caps should be placed in only 2 orientations: 0 or 90° Auto insertion machines ( if your factory uses them) can only place 2.5 and 5mm pitch caps and only rotate 0 or 90°. • Even hand assembly best practice requires only 2 orientations of polarized TH components. 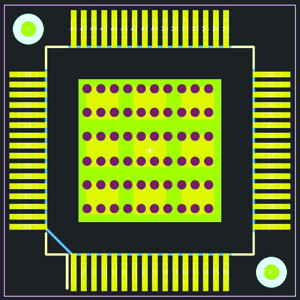 • On a double sided reflow PCBA (SMT parts on both sides) heavy SMT parts should be soldered on the second reflow cycle because heavy parts can fall off the PCBA. Design should be checked for heavy parts only on one side.